February 10 Update: The Providence total has been corrected to 16.6", making this the 9th biggest snowstorm. 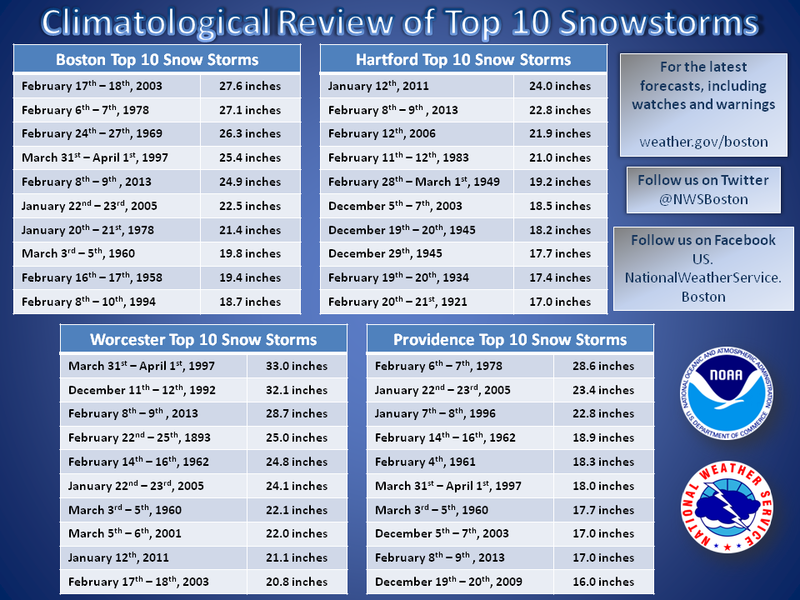 As the snow has wound down over New England, the National Weather Service is reporting top 10 storm snowfall totals at its major climate reporting stations. The preliminary total of 31.9" at Portland was an all-time record, but official climate records at Portland extend back only to 1941. The current blizzard developing from New York northward through southeast New England is being widely touted as a potential record-breaking event. 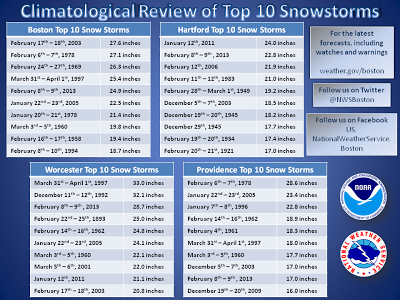 Here are the top 10 daily snowfall amounts (inches), from NOAA/National Weather Service data, for the major climate reporting locations in Massachusetts, Connecticut, Rhode Island, and southern Maine. The stations are Boston (BOS), Hartford (BDL), Providence (PVD), Worcester (ORH), and Portland (PWM).